There are a certain type of buyers that do a lot of research before narrowing down on a particular brand to buy from. There are also a group of buyers that don’t bother doing any research at all, and they often end up buying wrong products from the wrong brand. But then there are a small group of buyers that only buy from a brand that’s synonymous with the product they are looking to buy, and so they don’t need to do any research at all. If you couldn’t already tell, I’m talking about SINGER here. It’s the only brand that’s synonymous with sewing machines, although Brother is a distant second. 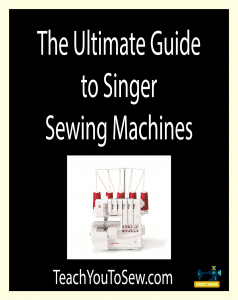 However, Singer has been around since so long now that even your grandma may have used a Singer sewing machine, which was probably durable enough to be passed on to you. But it’s very likely that machine outdated now. 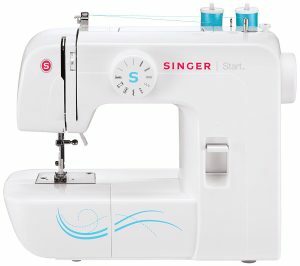 However, what’s not outdated at all is Singer’s reputation, and its commitment to offer the best of the best in pretty much every sewing machine category you can imagine of. With more options comes a greater level of confusion, though; and it can be very overwhelming if you don’t even know what exactly you should be buying. But if you’re reading this, you can sit back and take a deep breath, as you won’t need to go through any of that trouble. I’ll be walking you through the 6 best Singer products on the market, and all you need to do is choose one that meets your needs best. How about a super sophisticated professional grade Serger for the first pick? 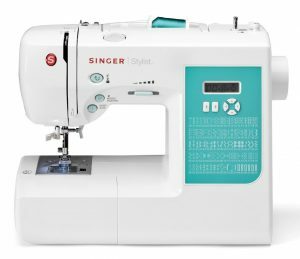 The Singer 14T968DC is an overlocker sewing machine, but it has a whole lot more to offer than the typical options in this segment. Now, if you’re wondering why I didn’t go with something beginner-friendly instead of a machine as advanced as the14T968DC that looks like it’s going to take years for beginners to learn to use properly, then let me tell you just one thing: Don’t judge a book by its cover! The 14T968DC is fairly beginner-friendly; don’t let its intimidating exterior fool you. However, at the same time, it’s also highly versatile and extremely efficient. Talk about getting a great head start for beginners! Now, enough of trying to make you feel relaxed with the overwhelming design of the 14T968DC. Let’s get to the technical features now. With as many as 4 different thread capabilities, the 14T968DC offers a huge range of stitch options. There would probably be no sewing project under the sun that the 14T968DC wouldn’t be able to help you with. Now, for all those of you that still haven’t bought my reasoning for the 14T968DC being as beginner-friendly as a manual handheld sewing machine, let me tell you that it’s a highly ADJUSTABLE sewing machine (in terms of stitching). The tension system adjusts automatically on its own, and the cutting width is adjustable as well. That’s a rare combination of ease of use and flexibility for you right there. The beginner-friendliness is further enhanced by the flat locking feature and unique stitch options that are designed to take most of the challenge out of complex sewing projects. The threading, too, is as easy as it gets on a serger given you’re not doing it for the first time (in which case it’s likely to turn out to be a little tedious). Coming to the most important job this machine is supposed to perform – serging – it’s actually a bit of a beast at it. Even if you’re a beginner to serging but take the time to learn it on this machine, you’re going to serge like a dream. It also comes with a cover stitch, which is definitely one of the rarest features to find at this price point. Oh, and didn’t I say this thing is really efficient? Well, the 14T968DC boasts a stitching speed of up to 1300 stitches per minute. Now all said and done, let me also tell you that although the 14T968DC isn’t a bad option for beginners, they can’t expect to be able to use all its features right out of the box. This is especially true for those that have never touched a serger. For them, there is going to be a learning curve, and some may even find it to be a bit steep. However, once you do make an effort to learn to use it the right way, you will thank yourself for doing so. Finally, I’m amazed at how the 14T968DC manages to be such a “complete” product despite its price being far from on the higher side. Sophistication; versatility; speed. You name it. It has it. For any new sewer that doesn’t want to restrict their sewing to just being a hobby, the 14T968DC is definitely going to be one of the better options for them. Why the Singer 4423? As soon as you see how the 4423 looks like, you will probably have got your answer. The 4423 is fairly basic with a traditional design but impressive functionality. This is going to perfectly fit the bill for people that aren’t ready for the learning curve that comes with the 14T968DC. There’s also the obvious price difference, which can matter quite a bit to beginners, as they may not want to spend a lot when just starting out. 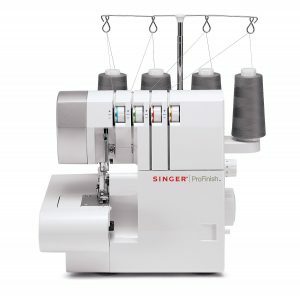 The Singer 4423 comes with 23 stitch options offering a fair bit of variety. Its automatic needle threader is something that’s going to make the lives of beginners easier as well. Despite coming with a very modest price tag, the 4423 manages to be surprisingly durable and high quality. The heavy-duty metal frame that makes up an important part of its exterior gives it the stability it needs to efficiently handle even projects of a complex nature. The Singer 4423’s ability to work on heavy-duty projects is further enhanced by its strong motor, which you would really be lucky to have at this price. The 4423 is just as efficient as it’s durable, thanks to boasting a stitching speed of up to 1100 stitches per minute. No wonder customers that bought this hidden gem (that I’ve worked hard to dig up for you, by the way!) are all praise for it. Although it looks and costs basic, it’s far from basic when it comes to its sewing abilities. Just like some of the other machines on the market costing twice or thrice as much as the 4423, it can handle all types of fabrics, be it thick and stiff or thin and rugged. It’s not a super fancy machine with lots of bells and whistles but it’s great at what it’s supposed to be. It produces extremely detailed stitches without much hassle, and that’s what most beginners are after anyway. I’d sum up the review of the Singer 4423 by saying that something that you MUST do before using this machine is reading the manual. Seriously, I mean it. If you don’t, you will likely have a few bad stitches and, likely blame the machine for that. So read the manual thoroughly once and you will sew on the 4423 like you have been doing it all your life. The SINGER 14CG754 is basically all about versatility. If you’re a sewer that would like to make the most out of your creativity, the 14CG754 may appeal to you. The 2-3-4 thread capability and 6 different types of stitches mean that you would be able to use it for any sewing project that you can imagine of. No matter whether the project involves making seams, rolled hems, blind hems, doing finishing work or even flatlocking, the 14CG754 would be up for them all. Now, let me ask you a question that most beginners can relate to. How many times do you mess up when sewing seams? Well, you don’t really have to answer it, as I know it can get pretty embarrassing at times. Beginners not only tend to mess up the seams, but also cause a lot of breaking and puckering. But I wouldn’t really blame you for that as making seams is one of the trickier sewing tasks and certainly not something beginners would be able to do right off the bat. However, what if I told you that you actually CAN sew perfect seams without spending half your life learning how to do it? Yes, Singer knows how common of an issue this is, so they decided to offer a solution to it with their 14CG754. The 14CG754 has a unique, FULLY adjustable differential feed, that’s going to make sewing perfect seams a breeze. What’s more, the breaking and puckering is going to be a thing of the past, too. If you’re really pleased to know that, brace yourself for the 14CG754’s next feature: A stitching speed of up to 1300 stitches per minute. Although sergers are often fast so the 14CG754’s speed isn’t exactly amazing, but the fact that it offers that kind of speed WITH a great level of efficiency is what makes it easily stand out. And of course, the kind of versatility the 14CG754 brings to the table is barely matched by other sergers priced considerably higher than it. Talking about versatility again, I was very pleased to know that the 14CG754’s upper knife is MOVABLE as well. Now although it may not seem much more than just an extra feature, it’s totally going to help you not lose your mind if you’re both a beginner and a regular sewer. It’s going to help you prevent trimming the fabric when you’re sewing, which is probably one of the most annoying issues beginner sewers tend to come across when using a serger. Color-coded lay-in threading system that’s going to make the threading seem like it’s the easiest sewing task ever – oh boy are the beginners going to love it! Oh, and did I tell you the 14CG754 is PORTABLE as well? Honestly speaking the 14CG754 has left even ME wondering how can a serger be SO much at this price! You’re probably missing out on a LOT if you’re not going for this super sewing machine for no reason. That said, I’m sure there are some that are going to have their own reason for deciding not to buy even something as good as the 14CG754. And it may be that they are not looking for a serger, but an embroidery machine. 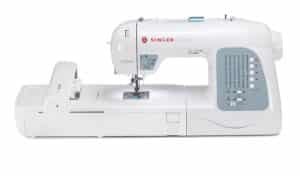 The Singer XL-400 is probably the best embroidery machine from the best sewing machine brand out there. In fact, I’ve little doubt it’s also the best budget embroidery sewing machine you can buy. But don’t mistake what I just said for having to compromise on the features or the functionality. There’s probably nothing that you don’t get with the Singer XL-400 that you do with the machines that cost well over a grand. 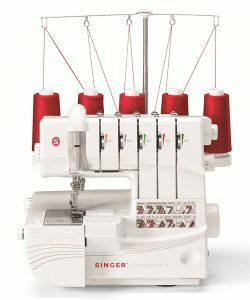 You would also be glad to know that the Singer XL-400 is a computerized sewing machine, which makes it one of the better embroidery machine options for beginners. The XL-400 is also huge in size; it’s designed for big sewing projects and really makes them look small when you get going with it. When it comes to its “sewing-only” mode, it’s actually not any larger than a regular sewing machine. However, when you need to use it for embroidery projects, you have to add the embroidery arm to it which makes it look very large and take a lot more space than it would without it. But you probably already expect that when planning to work on embroidery projects. And another thing that you will expect with a serious embroidery project is different types of challenging sewing tasks and a lot of eye strain. But brace yourselves for XL-400’s next feature that I’m going to tell you about – the LED options. It fills the working area with light, making it very bright and easy to work on. You may find those challenging tasks quickly turning into a lot of fun with a super cool working surface like that. Now, although embroidery projects usually involve sewing tasks well beyond what beginners would be able to work on, the XL-400 easily makes them possible even for beginners. Sure, the learning curve is inevitable, but you’re not going to have to spend months as a beginner just to start getting basic embroidery sewing tasks right. The XL-400 comes with a software right out of the box that has tons of embroidery designs you can start using right away. As for the hoops, there are two of them, a 4 x 4 and a 6 x 10. Again, a beginner would have no problem installing them, although it can be an extremely tedious task with some other embroidery machines. All you need to do is snap them where they need to be and boom, the installation is complete. The manual has a lot of useful information that WILL help you get around most of the “user” errors. Many of the bad reviews you may find about this product seem to be a result of not reading the manual and encountering a plethora of user errors due to that. Apart from the designs that come pre-installed with the XL-400, you can also download more from the internet. Something the more advanced sewers would be pleased to know is that the XL-400 wouldn’t have a problem reading most design formats under the sun, be it HUS, PES, FHE, DST, VP3 and many more. There’s also a lot of customization available with respect to the speed and other controls. The threading is going to be a breeze with the XL-400 as well, which should be a big relief for beginners. You would also get most of the pressure feet you need to get started with any kind of sewing project. Finally, I’m almost outraged at the fact that there seem to be so many unfair negative reviews for this product. To be very honest I wouldn’t be surprised if many of them turn out to be fake reviews by competitors or something like that. There’s no a way a product this good and affordable can turn out to be so bad for so many customers. The top (and highly positive) reviews this product got further add to my suspicion about the bad reviews. And some customers just seem to be “too hard to please.” The product was delivered a little late? One star rating. The product didn’t come with something it was supposed to (that they could easily get from the supplier by contacting them)? One star rating. You didn’t read the manual properly (or at all!) before starting to use the machine and encountered several user errors? One star rating with a long negative review. Taking all that into consideration, it would be wise to not let all those uselessly negative reviews fool you. The XL-400 is a kind of product that you just can’t go wrong with if you’re after a great embroidery machine that’s also very functional as a sewing-only machine and priced very affordably. 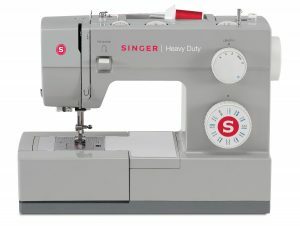 There are only a few sewing machines on the market that are unique enough to offer something more than what most sewing machines typically do, and the Singer 7258 is one of them. This is especially with respect to those unique sewing tasks that are easy to mess up when using other sewing machines. That being said, the 7258 is one of the best, if not the best, sewing machine for making zigzag stitches and other more technical sewing tasks. It’s also a computerized sewing machine, and comes with as many as 100 built-in stitches that cover all types of sewing needs. Working on a “stretchy” fabric? The 7258 got 8 different stitches for that. Find making buttonholes difficult? It’s going to be easier than it has ever been with the 7258, thanks to its 7 fully automatic buttonholes. But the 7258 simply blows away its competition when it comes to decorative stitches, as it boasts as many as 76 of them. Sewers that have been sewing for decades as well as the ones just starting out like the Singer 7258 alike. It hasn’t been crowned the Consumers Digest aware winner twice for no reason, after all. If making zigzags is one of the regular sewing tasks you work on, just do yourself a favor and get this little boy. You’re not going to regret it. Anyone that says you can’t start sewing on a shoestring budget is either not much knowledgeable about sewing or just hasn’t did their research well. Although it can be hard to find a sewing machine priced very cheap and still being adequately functional and durable, it’s definitely possible if you’re willing to dig around a bit. But as you’re fortunate enough to be reading this, you won’t have to do even that, as I’ve already did all the hard work for you. So simply put, if you’re on a very tiny budget and just looking for something perfect for you as a beginner, the Singer 1304 is going to be right up your alley. It’s so easy to use that you’d be hard-pressed to not figure out how to use ALL its functions within an hour of unpacking it even if you have never sewn before in your life. The manual comes loaded with step-by-step instructions and a lot of diagrams. Although its priced unbelievably cheap, it doesn’t shy away from heavy duty projects. The durability is certainly there and with a bit of carefulness, it’s certainly going to last you a long, long time. The start free arm allows the 1304 to be a perfect travel machine as well, as it’s highly portable. There are 6 built-in stitches (believe me, they are enough of people just starting out! ), twin needle sewing system, automatic bobbin winding and basically everything that helps a beginner going as quickly as possible.